The Ella Jayne Home Collection brings the beauty and sophistication of inspired bedding to your home, so that you can get a relaxing, rejuvenating night’s sleep every single night. The perfect choice when you crave the cloud-like comfort of a down comforter in a price range anyone can afford. 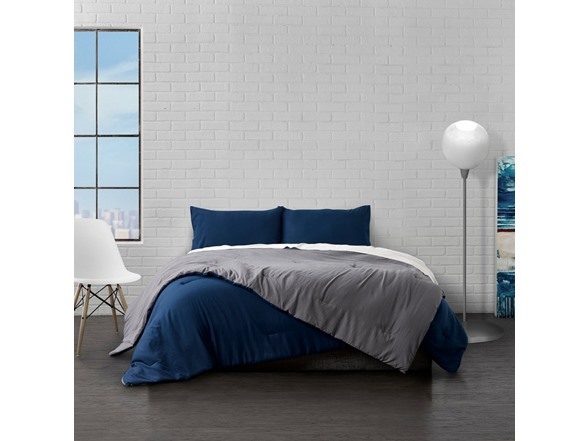 Filled with a soft poly fiber fill, this stylish two-toned Garment washed comforter will keep you warm and cozy, these superior comforters provide the softness of down with the perfect level of support for everyone, no matter your sleep style. Includes 1 Comforter. 2 Shams (Twin includes 1).